A few weeks ago, I, together with Laureen, was flew into Cebu by MAC Cosmetics for their Archie’s Girls Collection launch. Fortunately, we had a free day so we forced our good friend Kryz who then forced her friends to take us to the beach. 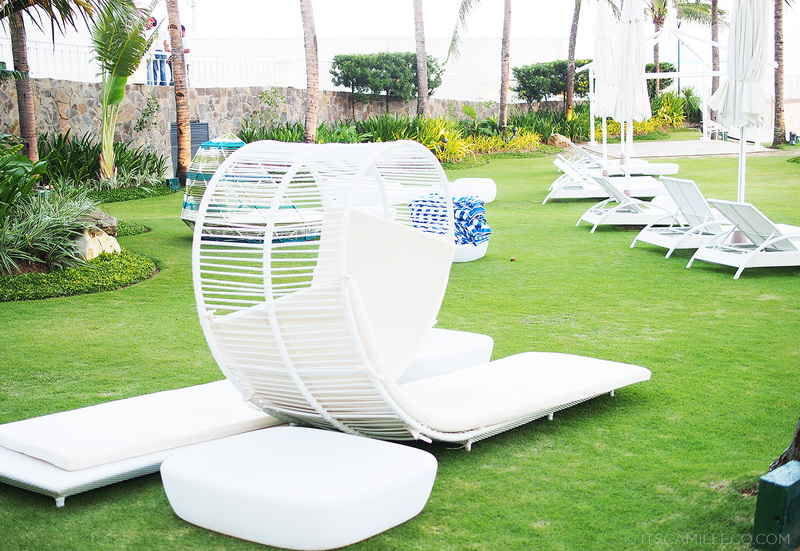 They ended up taking us to this newly renovated beach resort called Mövenpick which is just a good 30-40 minutes away from Cebu’s city center if you travel by car. When we got there, we were blown away by how picturesque the place looked! For a minute there, I thought I was abroad! Infinity pools, jacuzzis over looking the city, white sand beach, an international DJ and a modern bar by the beach–everything was so impressive! It was just what I needed. It’s my perfect escape, away from the hustle and bustle of Manila. Sigh. How I wish Manila has something like this! Imagine having the luxury of relaxing by the beach, just minutes away from the city! Cebu – 1, Manila – 0. I’m sure a lot of you feel the same way–longing for the beach! Summer can do that to us. Even my shopping priorities are now beach-centric! I can’t stop buying beach essentials! This isn’t necessarily a bad thing though. 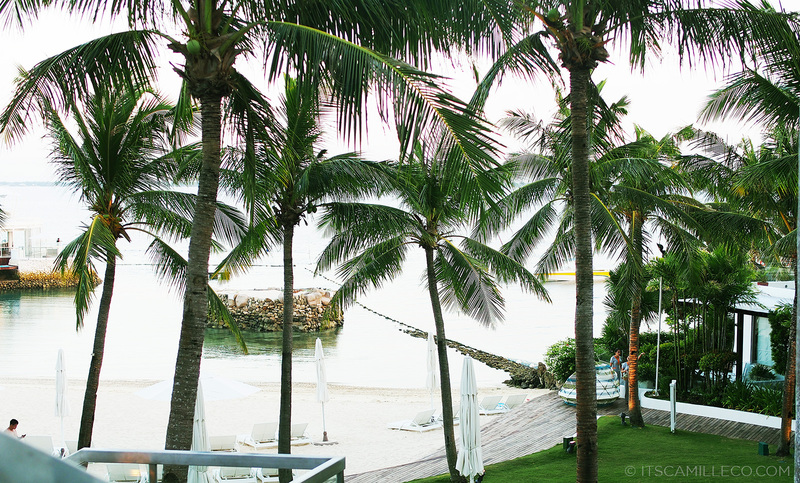 I am going to the beach again, after all–Boracay bound this May! Woot! Anyway, I thought I’d share with you some of the new beach essentials I found like these hip sunnies from Charlie. I have a dozen or so sunnies from this brand. They’re so affordable, which makes them even more beach-friendly. When you’re out there on the beach, swimming and playing around, you need hassle-free, easy-to-handle sunnies that won’t pain you every time sand gets in between your glasses or a light scratch is made. Don’t you agree? Keep you Chanel sunnies safe and let Charlie take center stage. Besides, Charlie has all the coolest designs! 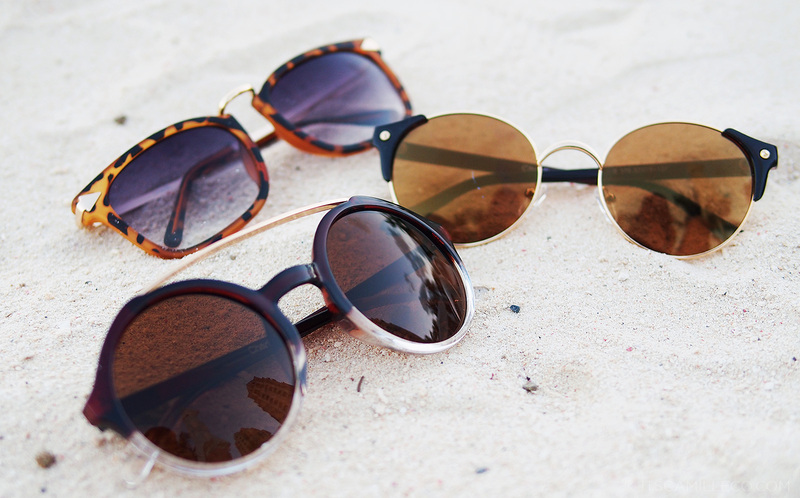 Aside from sunnies, of course, you’ve got to stock up on bikinis. I mean what beach trip is complete without new bikinis? I got this from Bayo. A pleasant surprise, I might add. I usually find it hard to look for bikinis from local shops due to my lack of…let’s just say “blessing”. This, however, is able to create the illusion that I’m not lacking as much in that area. LOL! Bonus points because it’s in a print I love! It’s the perfect addition to my sea of striped, floral, and plain bikinis. With such a fun and funky print like this, it’s a match made in heaven with my yellow sunnies form Tomato! I may be entertaining aztec prints already but my love for striped bikinis will always come first. I have so many of these but still, I’ll probably never grow tired of them. I’ve said it before and I’ll say it again, summer = stripes! This yummy seafoam green striped bikini from Bayo is so cool and pleasant to the eyes, even the scorching hot sun is no match. It goes so well with my aqua-colored Tkees flipflops too! Ahhh…summer colors! I can’t believe I’ve never owned a Bayo bikini before. They’ve got so many colors and prints to suit practically everyone! If you plan to shop at any Bayo stores to get a bikini or other summer pieces, you might want to join their free getaway to Boracay promo. 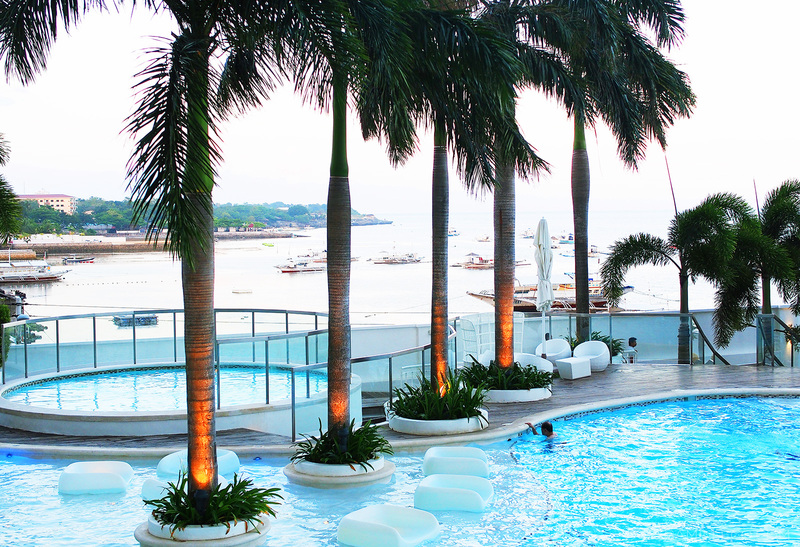 Not just any getaway to Boracay, mind you, it’s a free trip for 2 at Discovery Shores! Did that get you attention? Read on below to find out how you can join. It’s so simple! Deadline for entries is on April 5, 2013, so hurry! You’ve got 5 days to go! 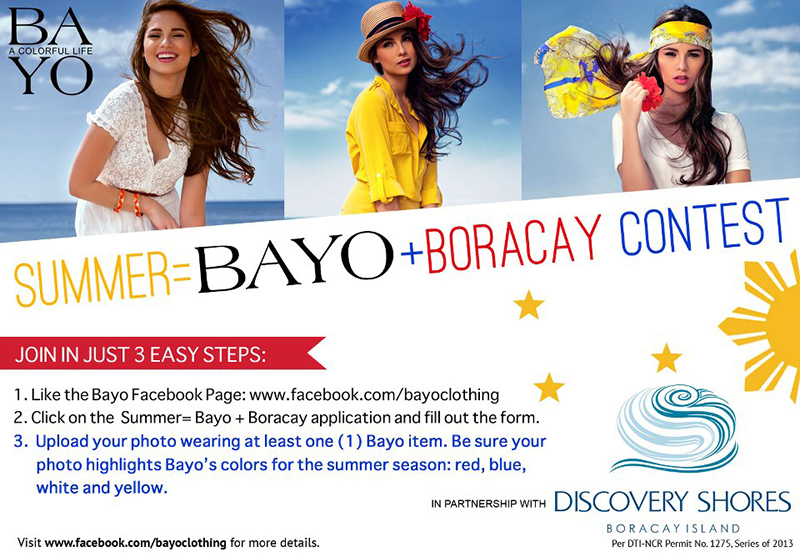 For more info, visit Bayo’s Facebook page here and follow @bayoclothing on Twitter. Good luck! Who knows, we might even bump into each other in Boracay! Awwwwwww I missed it!!!! Darn this comment box!!! Thank you Cathern! I need to checkout Charlie Apparel like right now!!! and those Tomate sunnies are quite affordable too, seen one at the mall. Thanks for sharing Camille. You and I both. I can’t wait to hit the beach! Love the aztec bikini. :) just like you hindi ako blessed … In that area. Hehehe. This bikini set is perfect for me. Hehehe. I’m loving the blue striped two piece! i like that you always share your new discoveries. Thanks Karen! I’m happy you like them! If we uploaded photos ba here in this contest it will also appear on ou fb ? Yes I do. OMG! Sing? Haha! Maybe one of my crazy days I will! Stripped Bikinis = Shima-Kini “縞模様ビキニ” :3 Yes.. This is very big in Japan. And I wants to go to Boracay. Simply because I’ve never been there. No kidding. Then again, I’m not much of a beach person. You’ve never been to Boracay!?!! Whyyyyyyyyy! Thanks Monica! :) The place really is lovey! Camille, waiting for you in those bikinis! Sugod na! They’re so sellable! Oeeh, I love the yellow sunglasses! They are very great with the bikini as well! I agree! Charlie sunnies are sooooo good! They don’t even look cheap! Thank GOD for Charlie! Mas affordable na ang mala-designer brand na sunnies! Beautiful sunset! :) I’d love to go there one day too! You should! :) One for each day haha! A gorgeous tropical getaway. How cute are the bikinis! Loving both of them. How did you remove the shadows effects in the pictures in your blog. Ohhhh I don’t know. My friend did my layout so I think it must have something to do with your theme and layout?